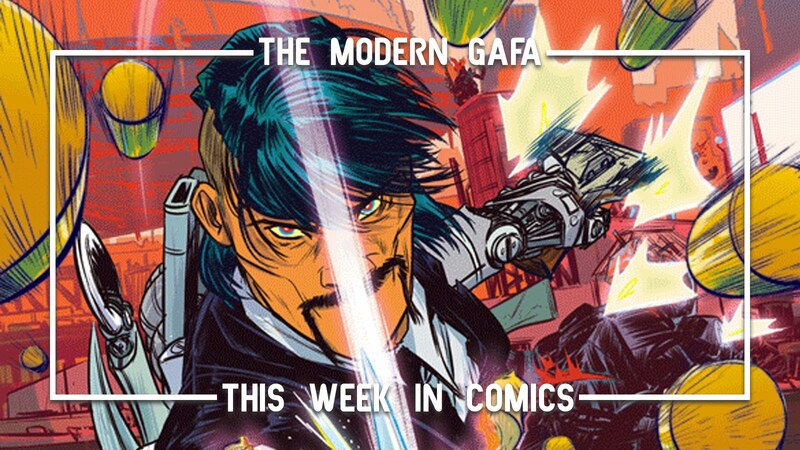 Another New Comic Book Day is upon us, and this is that time of the month where over half a dozen awesome comics hit the shelves in the same week! So hit the jump to check out some of the new comics coming to your local comic book shop this week. This is it, everyone! 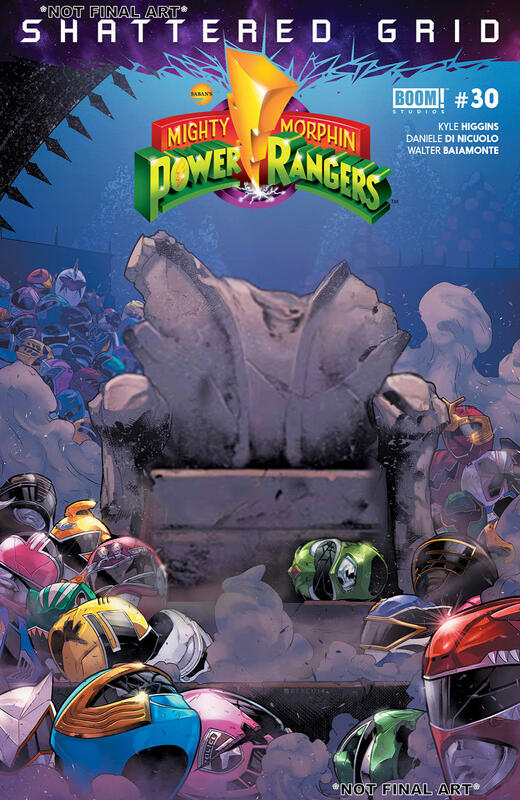 Shattered Grid soars to its finale as the final battle against Lord Drakkon begins. Dozens of Rangers join the battle as Zordon and Cruger arrange an alliance with Rita and Drakkon prepares a few tricks up his sleeve for his final defense. Last week we started getting some details about the 25th Anniversary TV special. Some fans aren’t excited since it won’t be a two-parter. I’m here to tell you that these comics are where it’s at. Tons of returning Rangers in one massive battle! This is the Anniversary special we’ve been waiting for. Sound off on all the cool stuff that goes down this issue: lots of Megazords, lots of Battlizers, lots of new Sentries, lots of cute moments between returning Rangers, and someone takes control of the Dragon Shield for the first time ever. Even Super Megaforce fans have something to be excited about. The battle itself runs across three beautiful 2-page spreads and each panel is filled with some wonderful bits of action. It’s hard to pick a favorite - but I really dig seeing three Gold Rangers fight together. Crossovers are a comic artist’s biggest nightmare, but Daniele Di Nicuolo does an amazing job here. The only thing that’s kind of a bummer is the almost complete lack of the Beast Morphers. Also, it’s great seeing Crueger and Zordon do the diplomatic mentor thing together, but gimme some Shadow Ranger already, dammit! This event has been monumental and proves the kind of quality we can get when a fan like Higgins is at the helm. I’ve said this before, probably in every one of these reviews, but I have meant it every time. Shattered Grid is quite possibly the greatest Power Rangers story ever told. How does the weather work in a world without gravity? We’re about to find out as Joe Henderson’s Skyward continues to deliver some of the smartest science fiction I’ve ever read. Willa’s lived her whole life in the world without gravity, but her father has locked himself inside ever since he helped cause the change in the laws of physics. He’s unfamiliar with the new world and as such isn’t prepared for the coming of a storm. Rain doesn’t fall without gravity, and bodies of water pool together and float in the sky. Some even have an ecosystem of fish living inside of them. When they crash into tall buildings, devastation rains. This is the horror that Willa must save her father from - because floating out into space isn’t scary enough, now you gotta avoid drowning in the air. I’ve only just now come to realize that Willa’s dad is my favorite character in this series. The way he marvels at the storm and starts geeking out at a world without gravity - which is about to kill him - is just adorable. In the face of death all he wants to know if insects are giant now. Skyward does a wonderful job if intelligently building a world where one simple thing changes and affects everything we know about daily life. The science behind this science fiction is top-notch. You can click here to pre-order your copy of Skyward Volume 1: My Low G Life, which collects the first five issues. The challenge matches are heating up with only three spots left to decide who will make the team. Who knew a bunch of teenaged boys poking each other with thin swords could be so exciting? This issue deals with Kally and what he fences for. While others have more personal and dramatic reasons for joining the team, Kally values the friendships and the memories he’s made on the team. It’s a sweet and simple story amongst some of the overdramatic ones going on between the bigger characters. 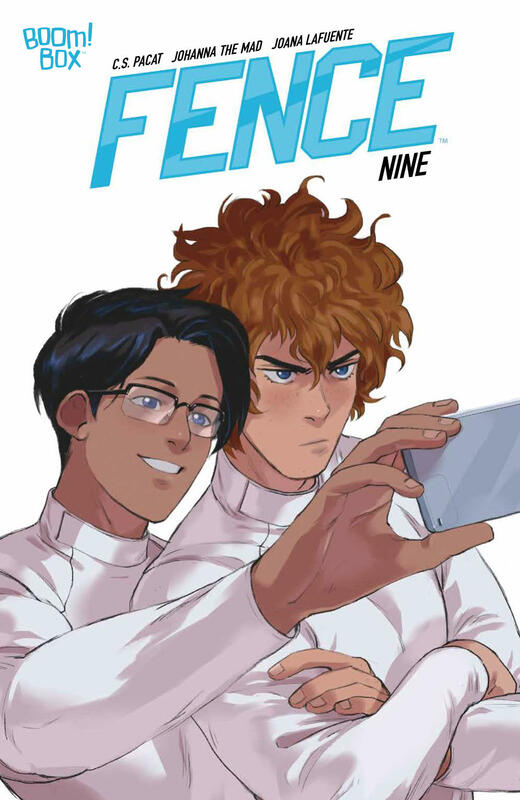 Speaking of which, Nicolas and Seiji come head to head when Seiji finally notices that Nicholas's fencing style is similar to Jesse Coste who beat Seiji in a tournament before. Little does he know, Nicolas is actually Jesse’s unacknowledged half-brother. Drama! We’ve all seen “American anime” but this is an American manga more so than anything I’ve ever read. There are little moments that really show off the creative team’s wonderful visual style that truly feels like I’m reading fusion of western comics and Japanese manga. Nathan Bright was just a TV meteorologist living it up on Mars. Now he’s on the run, accused of being the one responsible for blowing up the Earth and everyone on it. And when his face gets plastered on the news advising civilians to shoot to kill, his day just keeps getting worse. After an opening that appears to be setting up a later plot point, there are two major pieces to this issue. The first is a freakin’ car chase! It involves a transforming car that turns into a flying car and some cops shoot them up and it’s totally sick. The artwork in this sequence is kickass! The second piece of this issue deals with my favorite concept in this series. Nathan Bright is allegedly an artificial persona created by Ian Black - the perpetrator of the destruction of Earth - who replaced his memories so he could hide in plain sight. Agent Cross wants to find Black’s original memories to officially close the case. Nathan knows what this really means. Once they replace his memory with Black’s, Nathan will die. I compared this series to Total Recall last month and the comparisons keep coming. Nathan’s a pretty good guy. He didn’t blow up the Earth, so why should he have to pay for it? These kinds of questions are what make me love The Weatherman. It’s wild and weird, but it can still be thought-provoking. The writing really puts me in Nathan’s head and the artwork puts me in his world - every element of this is perfect! 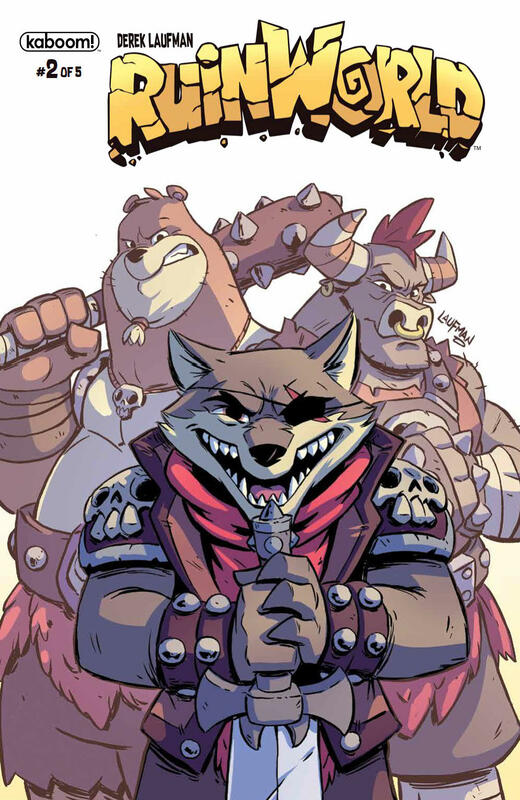 When this adorable animal dungeon-crawling fantasy comic was first announced as a limited series, I shouted to the heavens in anger. The first issue was so good I knew from the beginning that I was going to be devastated when it ended. It was that good. With this second issue, Derek Laufman proves that he’s going for quality over quantity. First, Rex the fox/cat half-breed and his companion Pogo the pig steal back their treasure map from Barri the bug. In need of some extra help, Rex seeks out an old friend: Kale the archer/thief/squirrel. This leads to what is effectively a sidequest. In exchange for her services, Kale requests the boys help her procure a rare artifact by joining her in a dangerous dungeon - named the Temple of Death - and facing down a fierce boss battle against a Golem. And because that wasn’t enough, Rex and Kale leave Pogo behind for a hot minute and he runs into a frog princess getting attacked by some shadow people but then more frog people show up and capture Pogo. Have I mentioned that I want more of this? There is so much jammed into every page, so many little details that aid in world-building, but it never feels bogged down or crowded. I think that’s a testament to Laufmen’s choice to use simple, familiar tropes instead of creative overcomplicated fantasy concepts. He’s not letting worldbuilding get in the way of his story. The result is a wonderfully charming tale in a wonderfully beautiful world. The dark secrets behind The Bowl - a mysterious walled city where chef are the top celebrities - simmer as Xoo gets into hot water. Everything’s rotten from the inside out and no one is safe. After risking her neck to get a rare ingredient that could save her sickly parents, Xoo finds herself locked up by the city guards after getting caught in an illegal, underground cooking tournament. She makes it out of their alive by the skin of her teeth and through some unclear circumstances that may connect her to the book’s secondary protagonist, the privileged Anant. Flavor has been serving up a mystery that has been slowly unfolding and this issue is garnished with more clues. I have a thing for “food fantasy” so I’ve just been in love with this series from the beginning. If you’re a fan of Anthony Bourdain, Toriko, Food Wars, or the like then I promise you’ll definitely eat this up. This is one of the best comics we’ve gotten from this series, which has always been an anthology of stand-alone stories, in a long time. And we also get a bit of backstory too! My favorite episodes of Steven Universe are the flashbacks, especially one’s involving Greg and the Gems interacting with normal, human things. This issue tells the origin of Steven’s house that’s attached to the front of the temple. Greg was originally going to help with the construction, but the Gems said they had it covered. Amethyst and Garnet got a bit impatient with that and thought they could fuse into Sugilite to make building easier. Sugilite, in turn, got even more impatient. Pearl is a really interesting character but it’s hard to get stories out of her that don’t revolve around her unrequited romance with Rose. That’s why I love her and Sugilite together. She doesn’t like Sugilite because she’s brash and reckless and kind of a jerk - not because of anything to do with Rose. 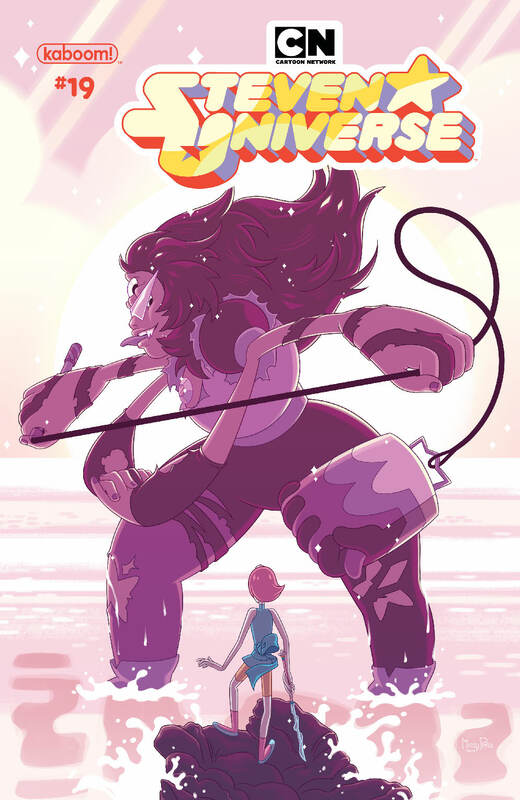 I’m glad the comics are able to give us more between these two because Sugilite’s expensive voice actress pretty much rules out that we’ll ever see her again. Until then, we have these excellent comics. In the near future, society is run by job share apps of all kinds. You’ve heard of “Uber for food” and “Uber for dog walkers” but now it’s time to meet “Uber for assassinations” in this new series by CHRISTOPHER SEBELA (Heartthrob, We(l)come Back, Harley Quinn), RO STEIN & TED BRANDT (Captain Marvel, Raven: The Pirate Princess), TRIONA FARRELL (Runaways, Mech Cadet Yu), and CARDINAL RAE (BINGO LOVE, ROSE). I am really diggin’ this one, guys. The first pages introduce us to Charlie Ellison, a young woman who makes a living by spending her day on a dozen different apps giving people rides, watching their kids, even renting out her clothes. And then someone tries to kill her. The Reapr apps work like any crowdfunding campaign and once it reaches its goal those funds turn into a bounty reward. Luckily for Charlie, there’s the Dfend app that lets her book a bodyguard named Vita to take out anyone who wants her unusually high bounty. Apparently, this is all legal. Charlie is just a normal girl - so why would someone want her dead and why would over two thousand backers pledge over two million bucks to see her taken out? That’s the real mystery that sits at the center of this zany, gut-punching thriller. The art is awesome, the dialogue is snappy, and the concept is so unique and original. But what’s going to make or break this series is going to be the relationship between its two main characters. Charlie is just a normal girl but Vita is the complete opposite, a shut-in who hates people and lives in a second-hand mansion. I just want to see these two go at it for the rest of my life.